I was once again delighted to visit the Mt. Cuba Center for their annual Wildflower Celebration. This is an event I look forward to every year. Their gardens are probably 50 years old and their woodland plant collection is top notch. However I've learned that this doesn't always guarantee for a good show. Plants are triggered to flower from a lot of different things. Some are slowed down dramatically by the cold or rain, while others don't care at all. 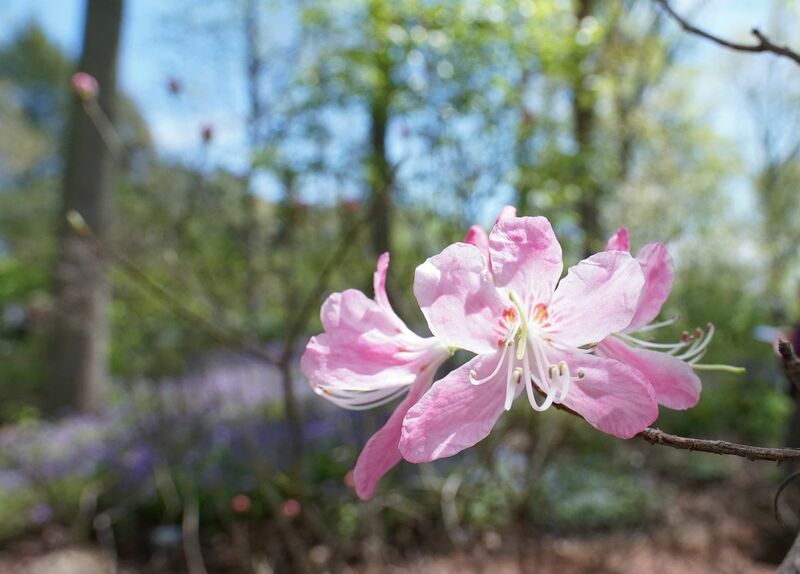 Lots of little factors can throw off the blooming of certain species. So this can all vary form year to year. Often by the time the Mt. 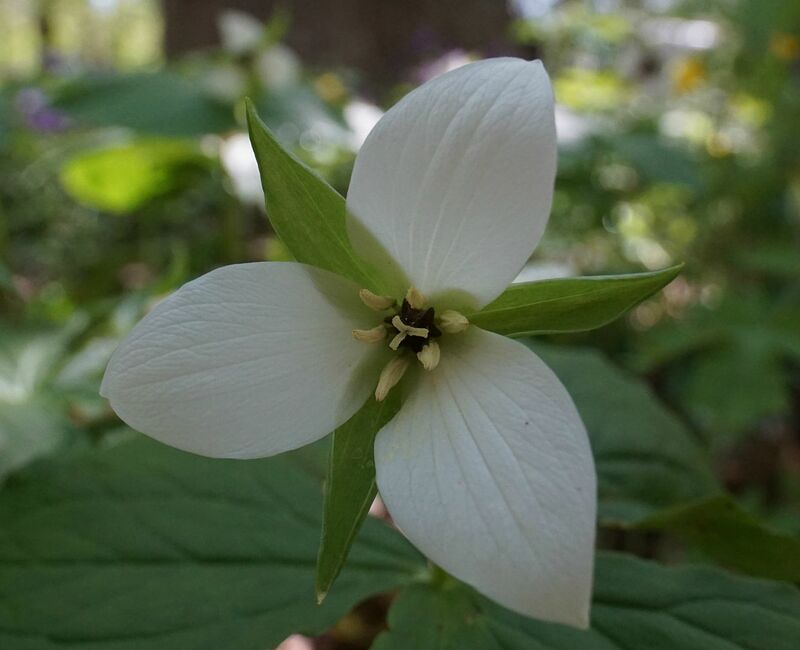 Cuba Center has their Wildflower Celebration plants like Hepatica, Twinleaf, Trout Lily (both white and yellow), Snow Trillium, and Trillium pusillum have all finished flowering. 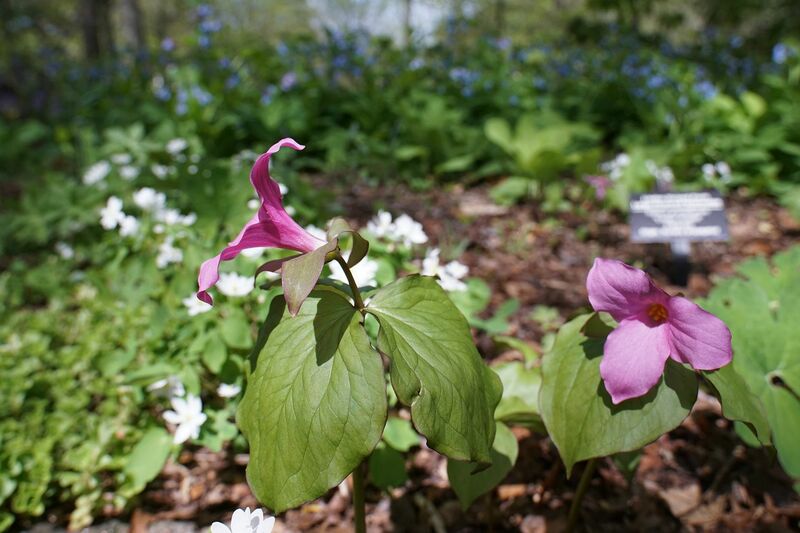 This year, though, these were all flowering, but most of the non Trillium ephemerals hadn't opened as much. 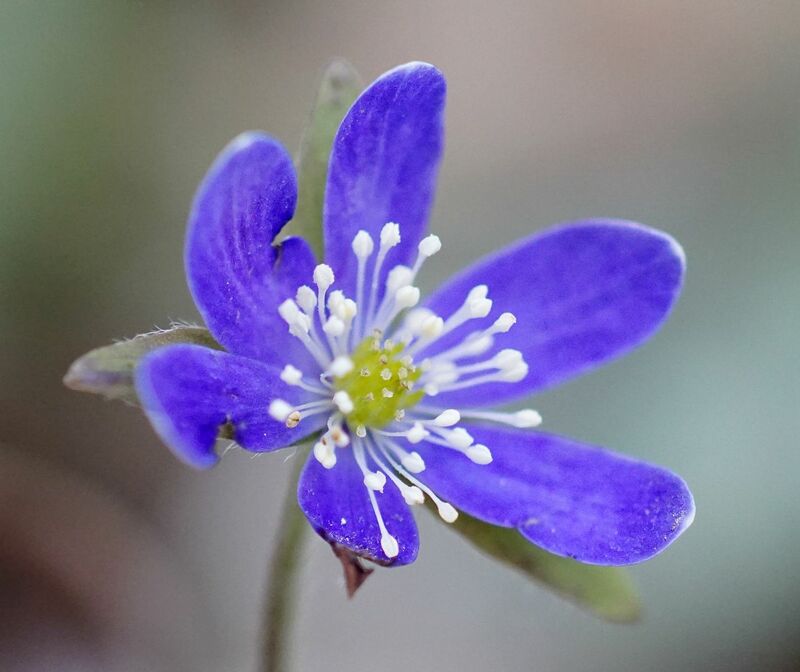 Often the forest floor to their woodland gardens are covered by a mixture of Virginia Bluebells, Fernleaf Phacelia, and Woodland Poppy, which all spread almost thuggish in the gardens there. A few years back all the stars aligned and pretty much every spring ephemeral was in full flower. 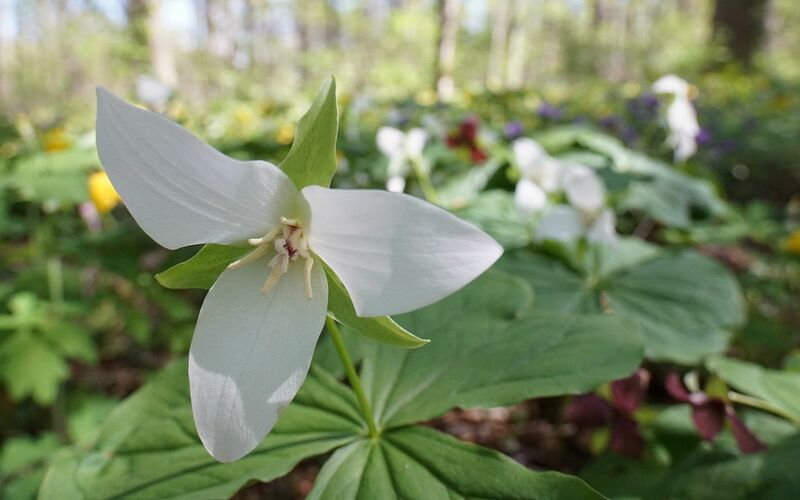 The Snow Trilliums, Twinleaf, and both Trout Lilies were all bloom in good number along with vast carpets of Phacelia, Bluebells, and Poppies to the point that the forest floor could not be seen. 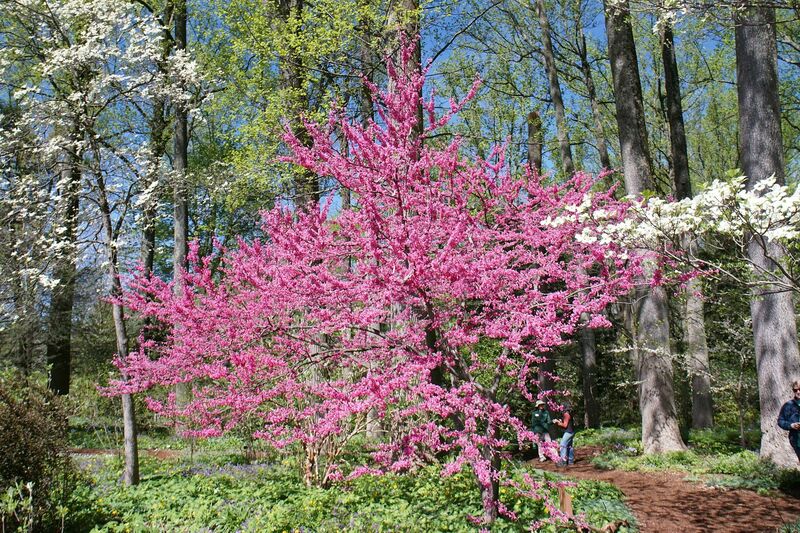 Creeping Phlox, Foam Flower, Bluets, Ragwort, multiple species of Spring Beauty, a variety of trees including Redbud, Witch Hazel, and Dogwoods were all in full bloom as well. And this wasn't just a few patches here and there as it often is; it was everywhere! This was also the year I saw Wild Camassia there, a native bulb no one seems to recall planting and have either died out or been removed from the gardens since. I have an awful picture of them somewhere so I know I'm not crazy but none of the gardeners there seem to recall the species ever having been planted. 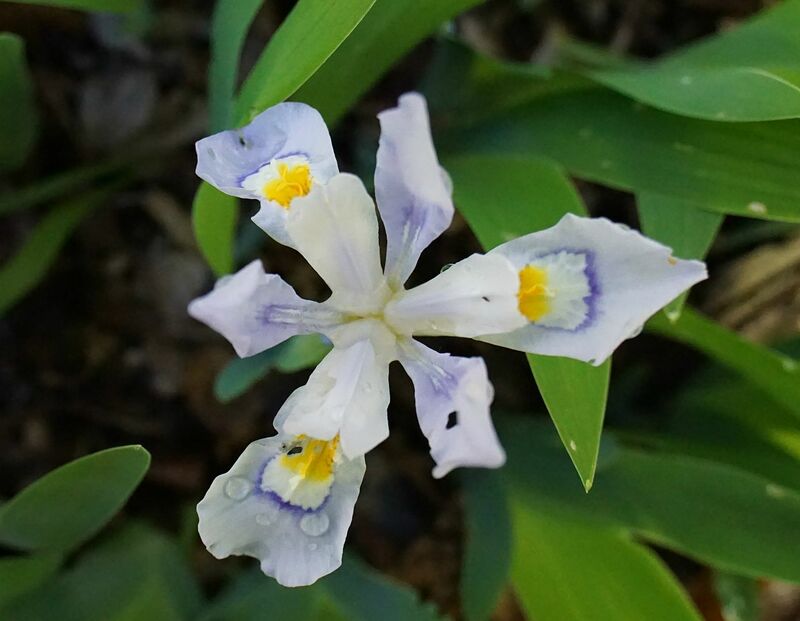 (It was likely removed because Camassia is more of a midwestern plant). This year's display wasn't as grand as that golden year. It's important to remember this isn't a flower show where plants are grown and timed in green houses and planted at the moment of perfection. 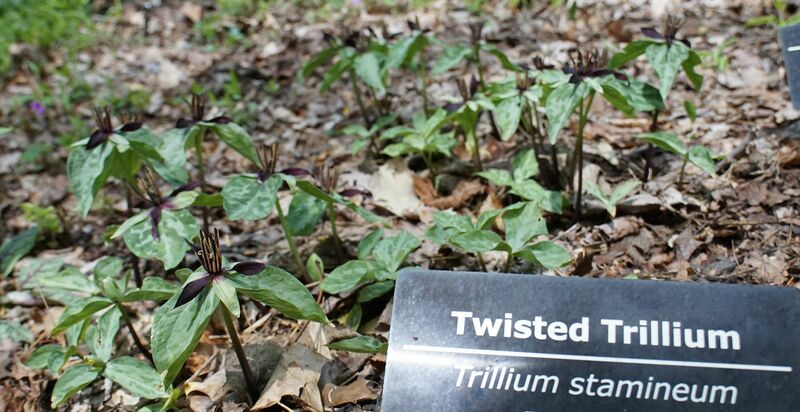 These are plants left to grow in the ground all year so their flowering is largely effected by the weather. I would never say it was a disappointment to go. 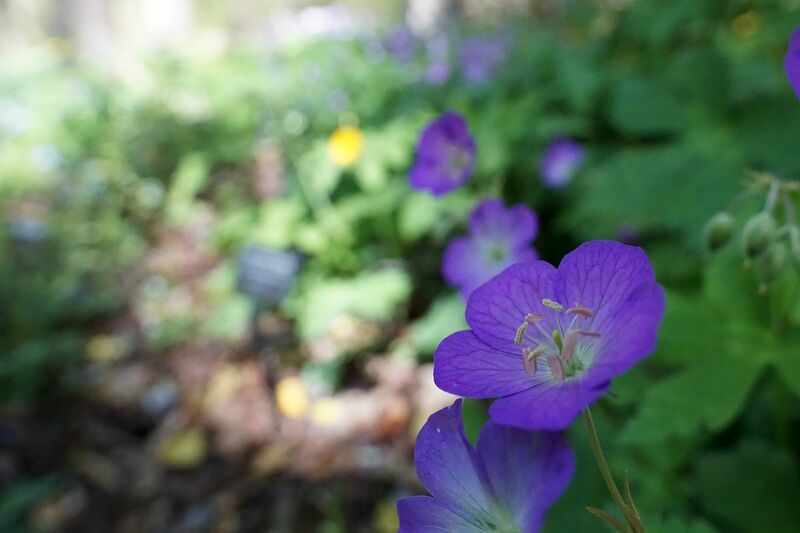 There are always tons of wildflowers in bloom just not in abundance throughout the gardens. 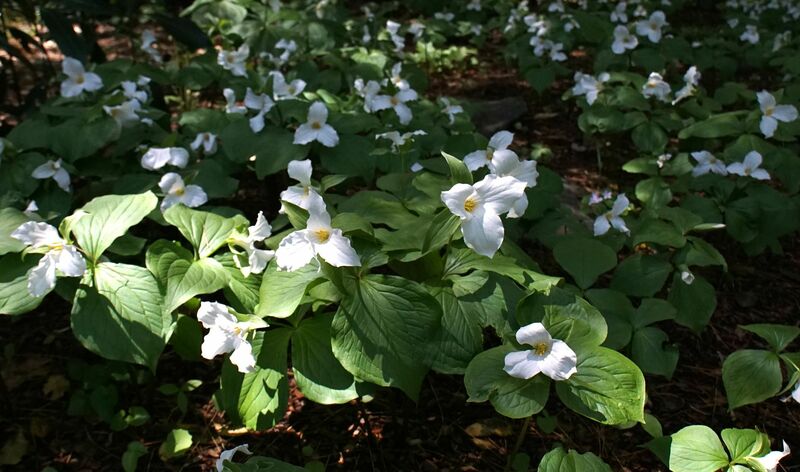 And as always it's worth going for the Trilliums alone. So here are a few highlights that I enjoyed seeing. 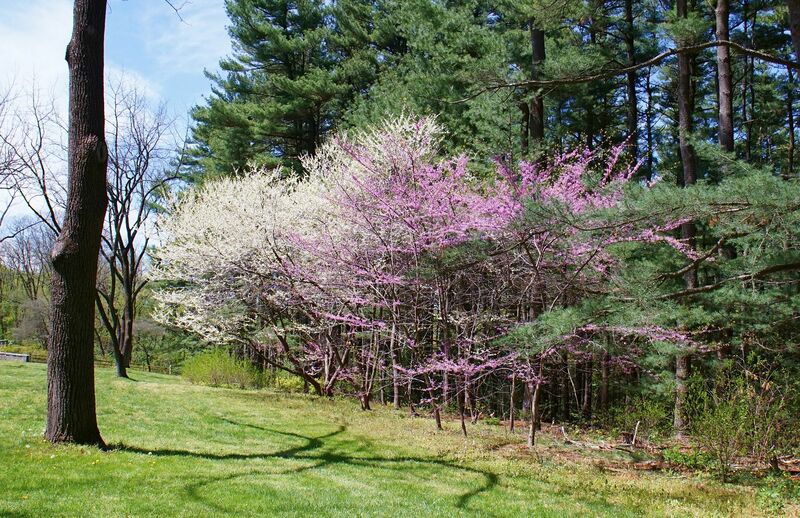 Eastern Redbud, Cercis canadensis. Also available in white. And Red! I've always found it odd how plants with colors in the name often aren't that color. I don't know what cultivar this is but it's certainly a centerpiece. 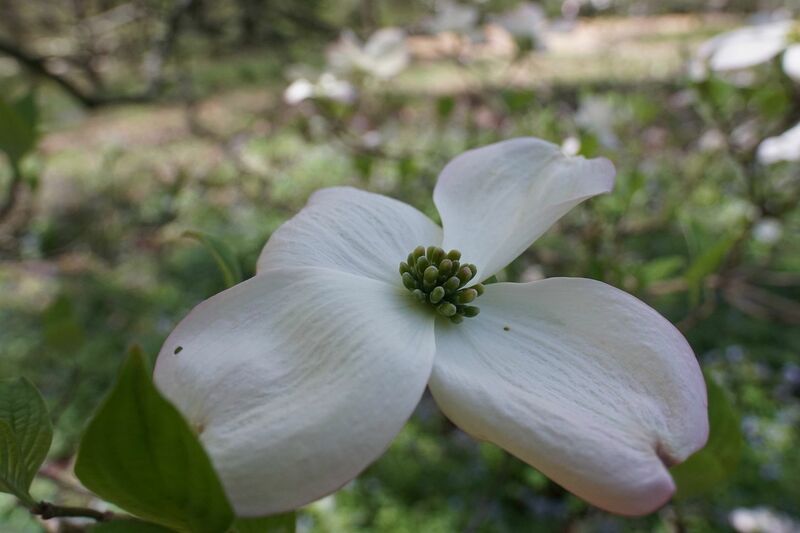 Beside it is a Dogwood, Cornus florida. It's a good combination but I feel like the red version Cornus rubra, or Native Wisteria Vine (not grown on the tree!) would make for a better pop of color. Cornus florida have deceptive flowers. All the flowers in this photo actually aren't open yet. Those greed buds in the center here are actually the flower which will have tube-shaped petals. 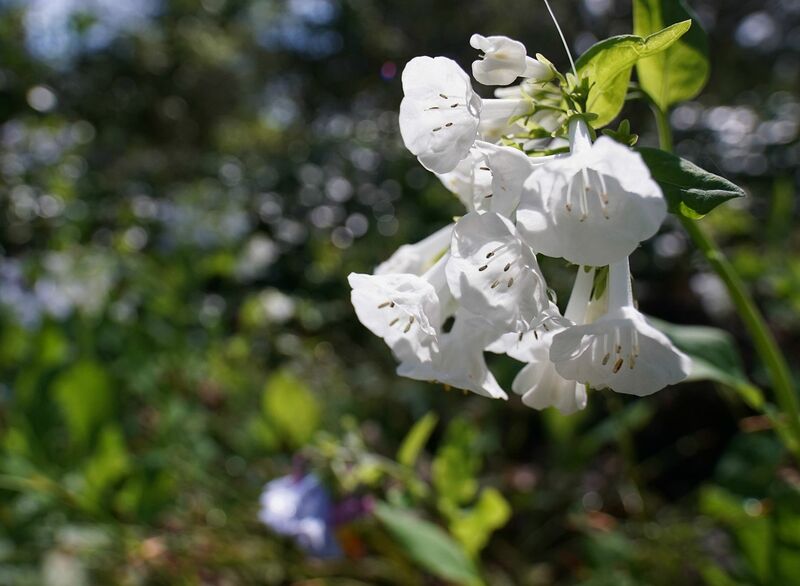 Surrounding them are white colored bracts, which are modified leaves designed to draw attention to the flowers instead of photosynthesize. Rhododendron vaseyi. Normally I don't go for Rhododendrons but this one was a cute color. They're very sparse with flowers compared to other species though. Normally I gush over Flame Azalea, Rhododendron calendulaceum, and their bright orange flowers but I don't think any were flowering there yet. Fernleaf Phacelia, Phacelia bipinnatifida. The Mt. Cuba Center is where I first learned about this plant and I've wanted it ever since. 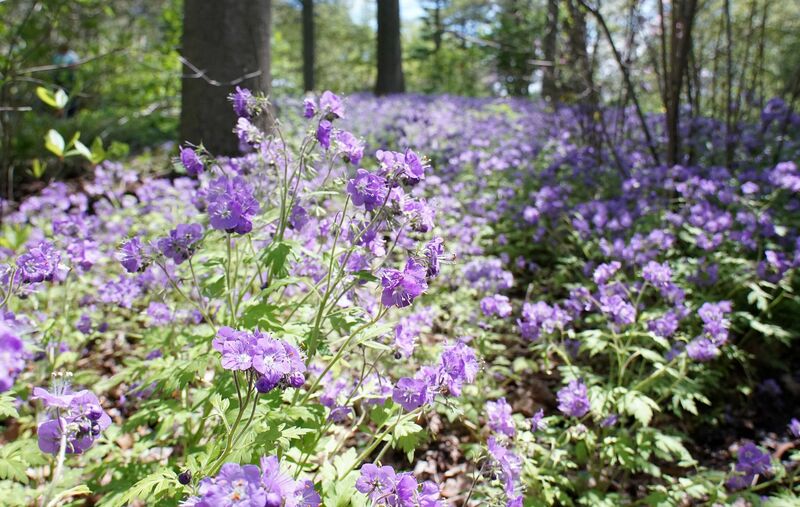 Who knew an aggressive spreading, biannual, that's swarming with pollinators, and turns forest floors into cloudy carpets of purple would be such a tough sell to the nursery industry. No one sells this species except for one awful nursery online that only sells it in bare root form, and the occasional native plant sale. I have to drive all the way to Delaware to a place just down the street from the Mt. Cuba Center to buy this plant and hope and pray that it reseeds itself in my yard. Please someone, just sell the seeds to this plant online. This was an awful year for Bluets too! I won't pretend to know anything about growing these or how they manage the moss patch at the Mt. Cuba Center. 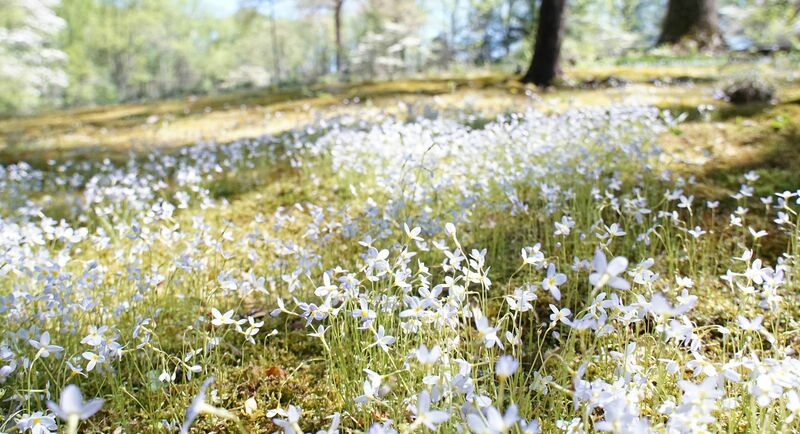 But in years past the whole moss patch was glowing thick with Houstonia caerulea. This year it was mostly just this one sliver of the patch in flower. I've tried to grow these too and they're tough to establish. The roots are extremely tiny and prone to drying out or rotting away or getting eaten. Everyone who sells them gives me conflicting reports. Dry shade, full sun, damp moss but only on a hill with well drained soil? It's confusing. I'm reasonably sure the Mt. Cuba Center occasionally harvests the plants from the patch to use elsewhere in the garden. 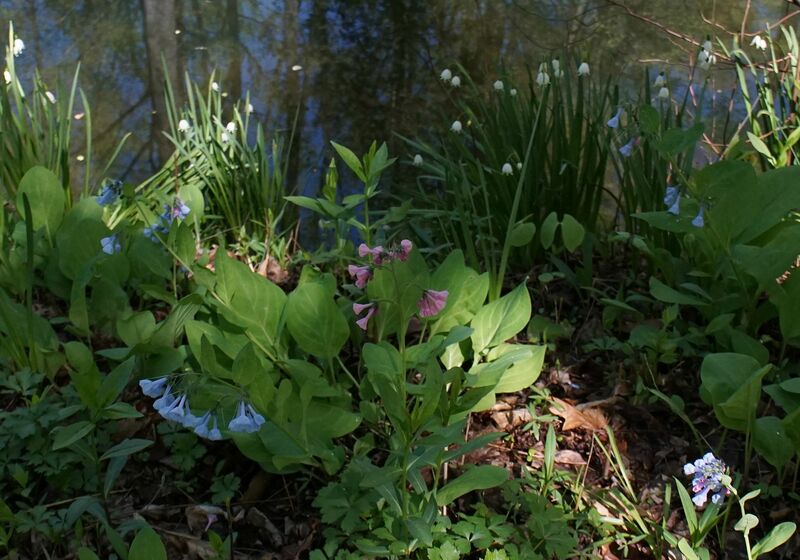 I've started seeing them growing in patches along the pond and in other moss rich parts of the garden. 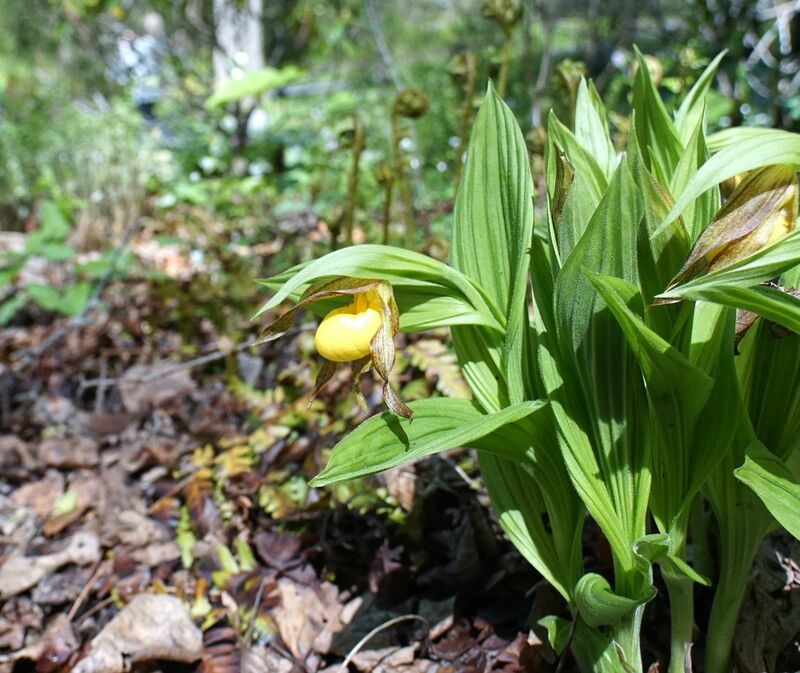 Yellow Lady Slipper, Cypripedium pubescens. 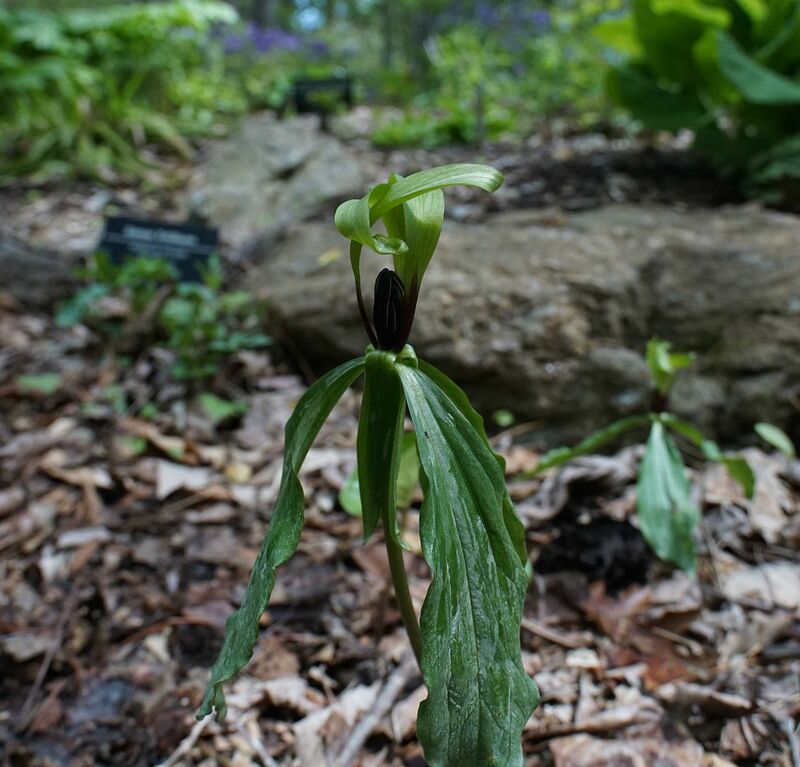 One of our rare native orchids. Well, more uncommon. They tend to only grow where trees have fallen in the woods and certain types of beneficial fungi have taken root first. Virginia Bluebells, Mertensia virginica. Both the typical blue form that is so common and a very rare red form. Normally these start to open up red and quickly change to blue when they fully open. The flowers stay that way a few days before falling off. With the red form though the flowers never turn blue. The Mt. Cuba Center also has a white form which has spread a bit since I first saw it there. The red form is still just that single stalk but the white here were pushing out a dozen or more. Both fall in comparison to the blue which I've seen dominated the forest floor in years past. 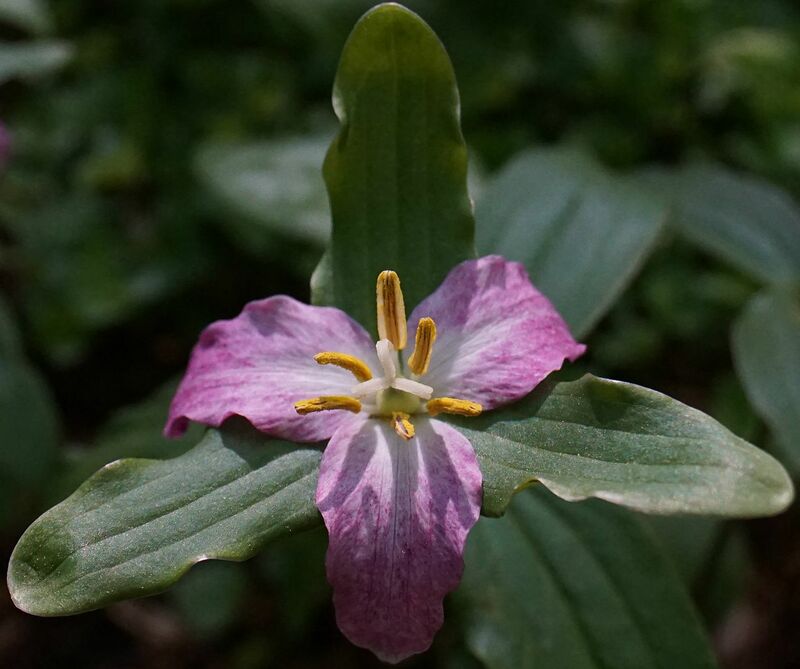 Trout Lily, Erythronium americanum. While I don't always see this plant blooming at the Mt. Cuba Center every year, when I do see them I normally see it flowering in large patches. This year though this one plant was the only one I noticed... odd. 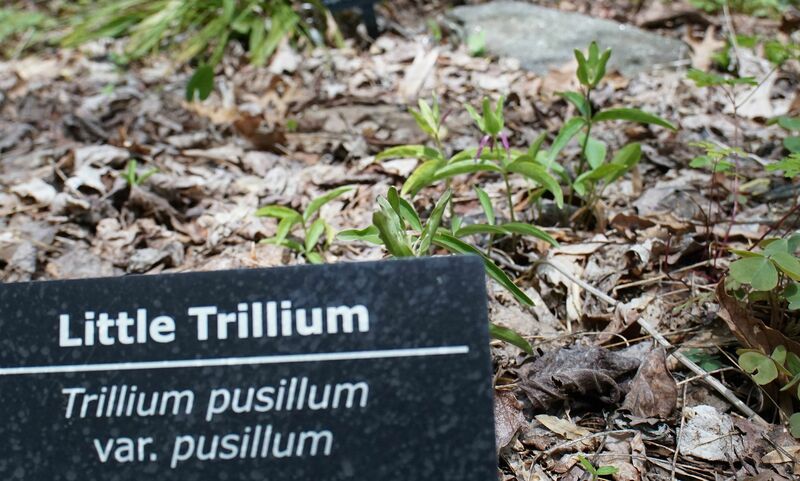 Trout Lilies are notorious for not flowering though. They spend too much time spreading by horizontal roots to form new bulbs. Each bulb then works on sending roots deeper in the ground but they only flower after reaching a certain depth, which can take forever. The result is a huge patch of leaves but no flowers every year. I'm told though that planting them in pots or adding stones a few inches under the bulbs will help stress the plant into putting its energy into flowering. I have yet to try this trick out. 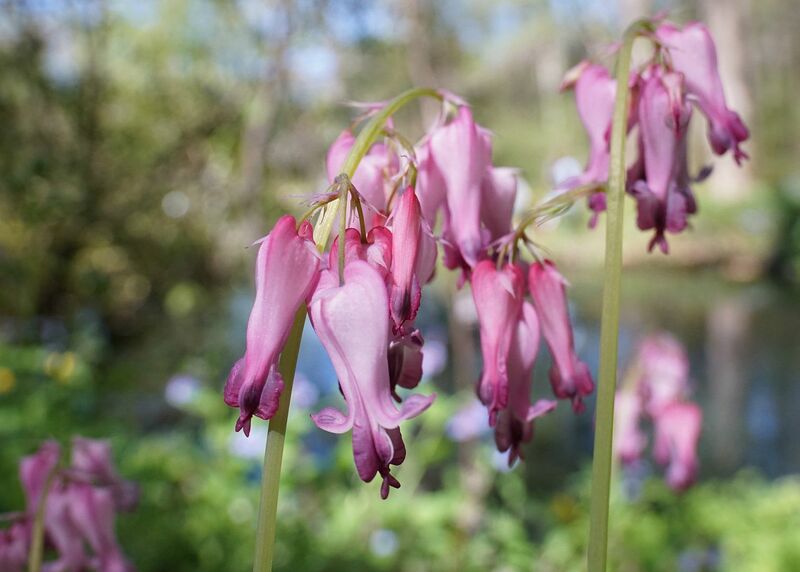 Swamp Pink, Helonias bullata. This is an endangered species I'm happy to see they still have there. On some years they have a dozen or so plants all blooming around the ponds but this year I only noticed this one. Some nurseries have found out how to germinate this species in captivity and are making it commercially available. I've tried to grow it in my gardens though but found it too finicky to survive here. I suspect it's not drought tolerant at all and requires constant moisture year round which I wasn't able to give them. After flowering for just shy of a week the flowers turn pink and eventually go full magenta before they finish flowering. When grown in mass they put on quite a show. All the white flowers look great growing together and then a week later you're treated to all the varying shades pink, red, magenta and so on. The Mt. Cuba Center has a whole garden featuring hybrids and unusual cultivars. Here is a red form of T. grandiflorum. Instead of opening white they open up red and stay that way the whole time they're flowering. Same plants but in slightly different light. 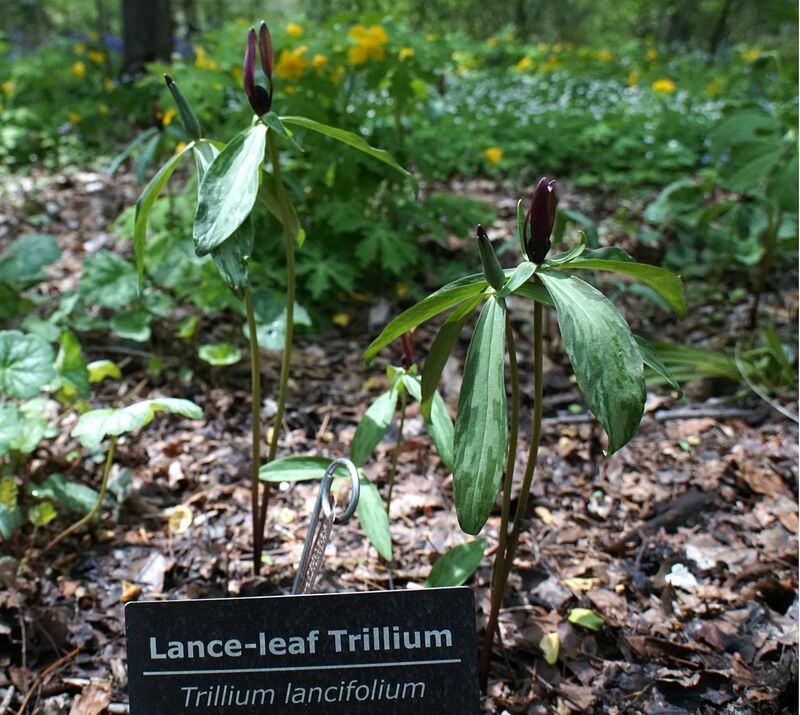 Trillium erectum is normally red as seen in the background here. This clump though was mostly a white form of the plant. Trillium simile has always been a favorite of mine. 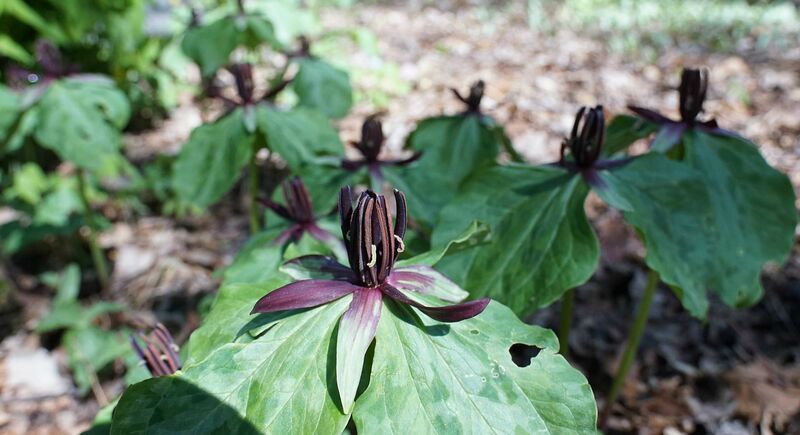 The dark center sets it apart from the similar looking Trillium flexipies. I've been meaning to commission this flower into a piece of jewelry; a button or pendant perhaps? Here they are growing in mass. 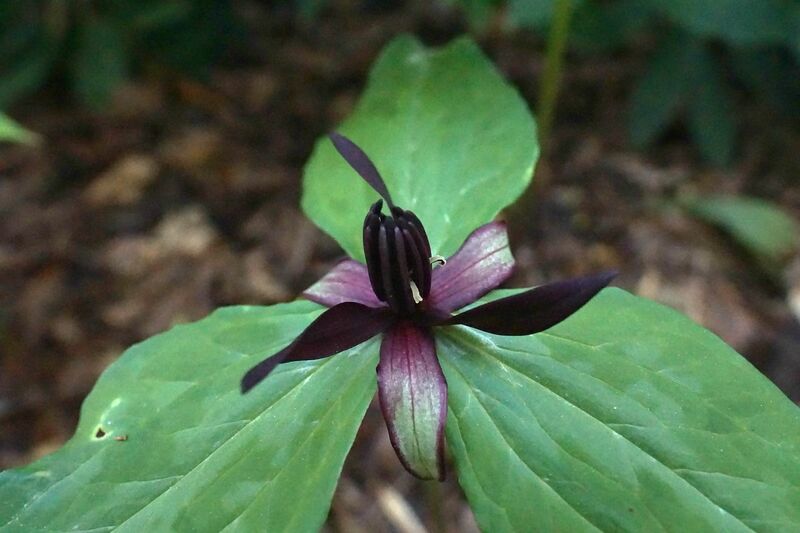 Sadly unlike T. grandiflorum I think the petals just fall off instead of change color. 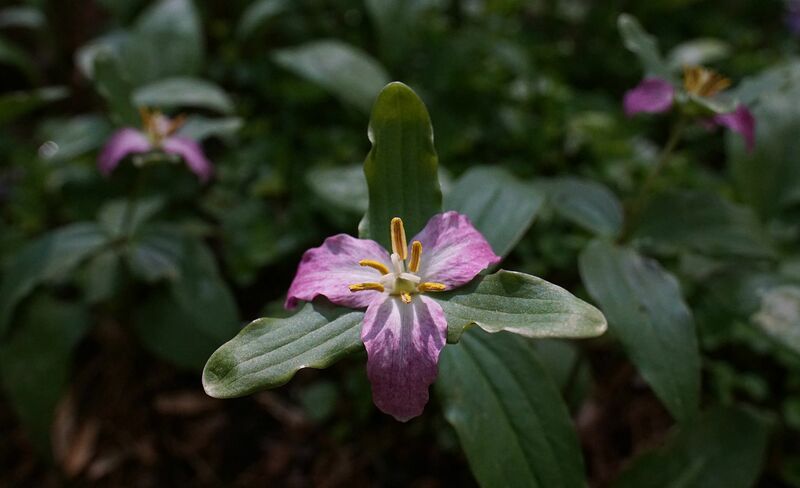 Trillium pusillum. Normally this one is finished flowering by the time the Wildflower Celebration is held each year. Even this one is past its prime. They do open white but turn pink before the petals fall off. 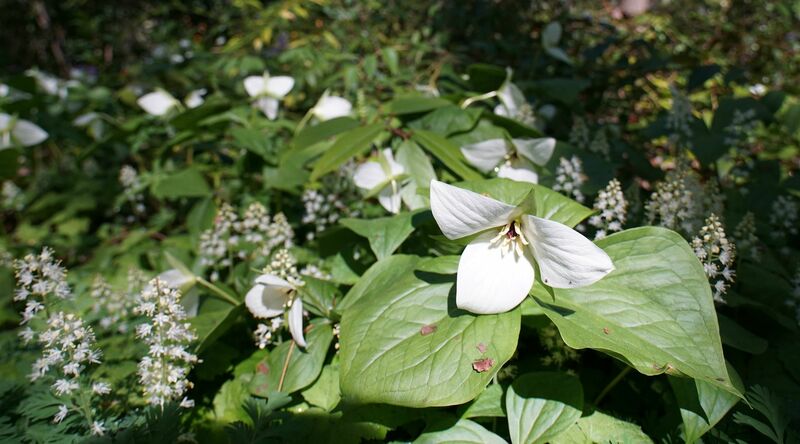 Despite having all the fun qualities of T. grandiflorum this plant doesn't create such a sweeping effect. They're much smaller plants and the flowers are no where near as large. Oddly enough after the petals fall off the three leaves just underneath give the effect that they have green petals. This is a fun one that's really easy to identify because the petals twist around. I've been wanting to grow this in my garden for a number of years but no one seems to sell it online. The Mt. Cuba Center makes growing this plant look easy because they seem to have a lot of it. Just down the road there's a farm that holds a native plant sale every year and I've seen plants provided by the Mt. Cuba Center sold there before. There was a sign for this species there but sadly they were sold out by the time I noticed it. 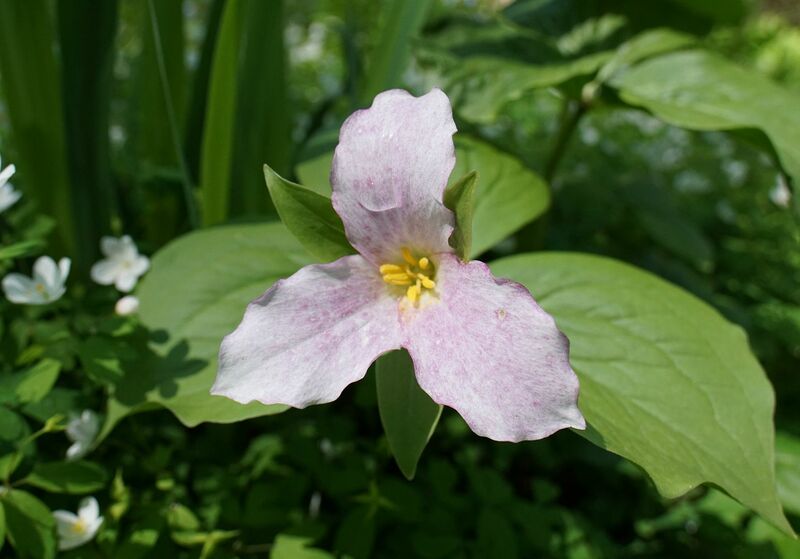 Trillium lancifolium. I've seen commercially available before but not often. It gets its name from the petals being so erect up into the air like a series of lances aimed up high. 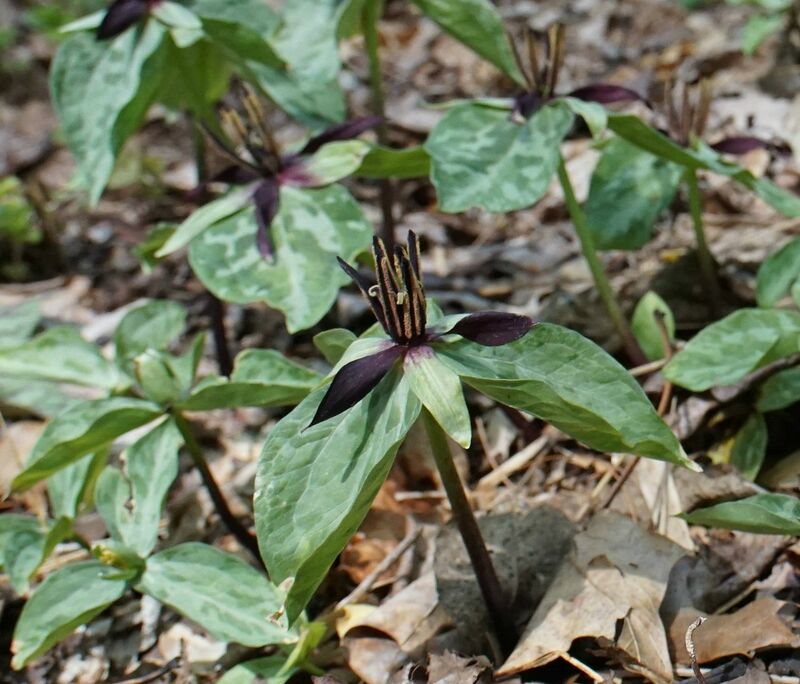 Trillium oostingii. An odd species I only ever see there. 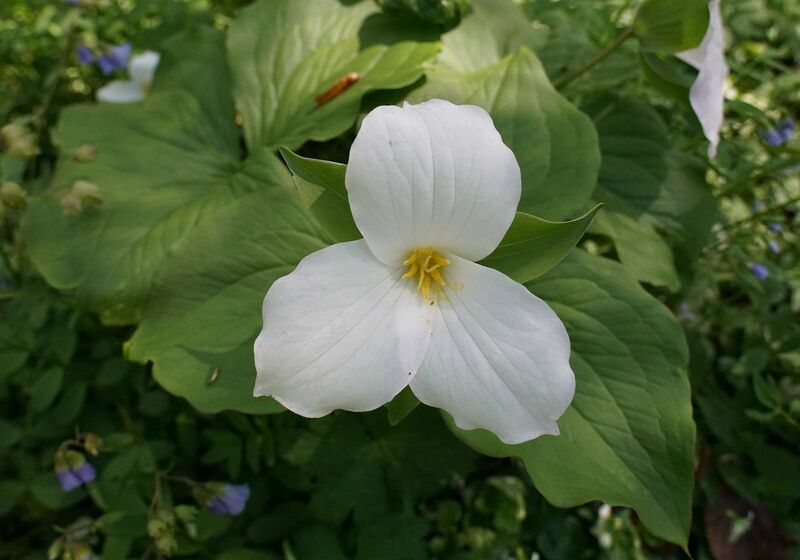 They had tons more Trilliums and variations there of growing in their gardens but I wasn't able to photograph it all as I've done on years past. 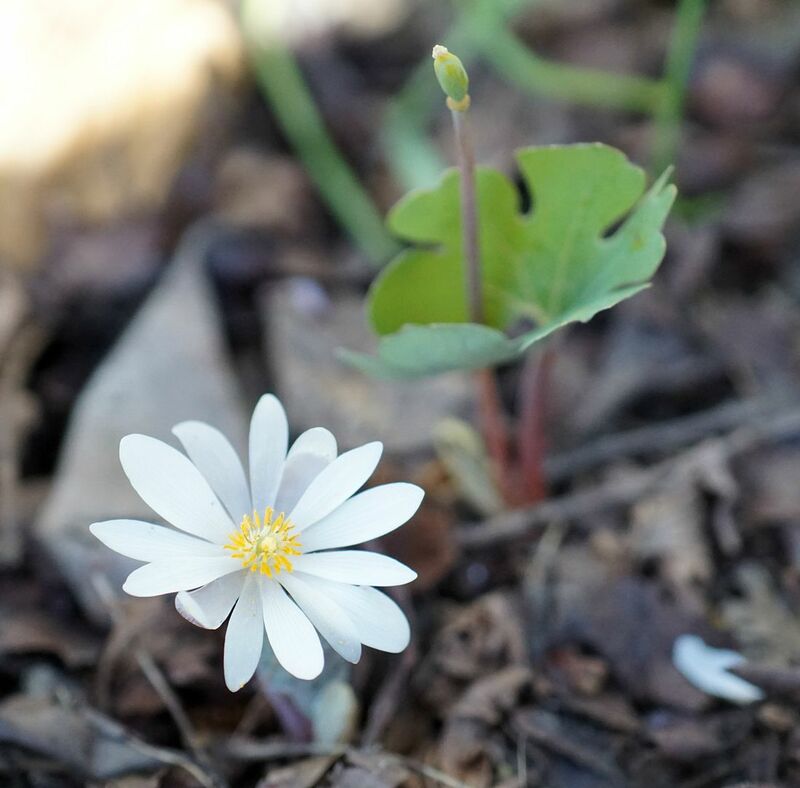 The patch of Bloodroot in the front garden had a few more flowering plants come up. You can see how leaf grasps the stem to help keep it safe. They only lasted three days this year, the Twinleaf actually lasted longer! 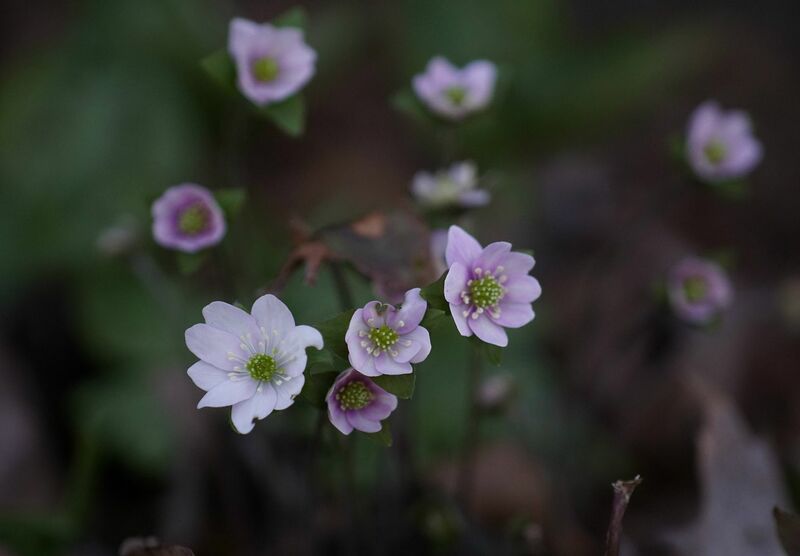 Hepatic flowers for a longer time and slowly changes color. Pictured here is the same flower as the one above it, but a day sooner. You can see how they start to fade over time. 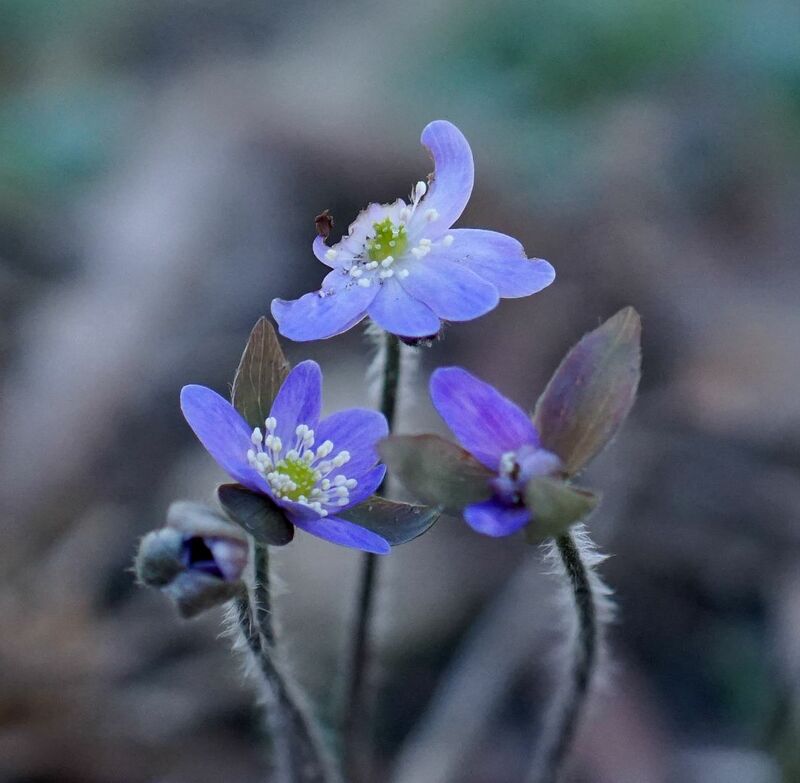 My second Blue Hepatica has more flowers on it this year than it did last. Neither is in good shape but hopefully this is sign they're starting to establish. When they were all planted in the front yard they did start to reseed. The majority of my plants have either white or pink flowers to them. Which I'm pretty sure are also the ones that reseed regularly as they tend to have far more flowers. They're pretty but I can only take so many white flowering plants. Need something to break up the monotint especially with such a large clump of Stonecrop right next to them which will turn into a carpet of white flowers in a week or two. 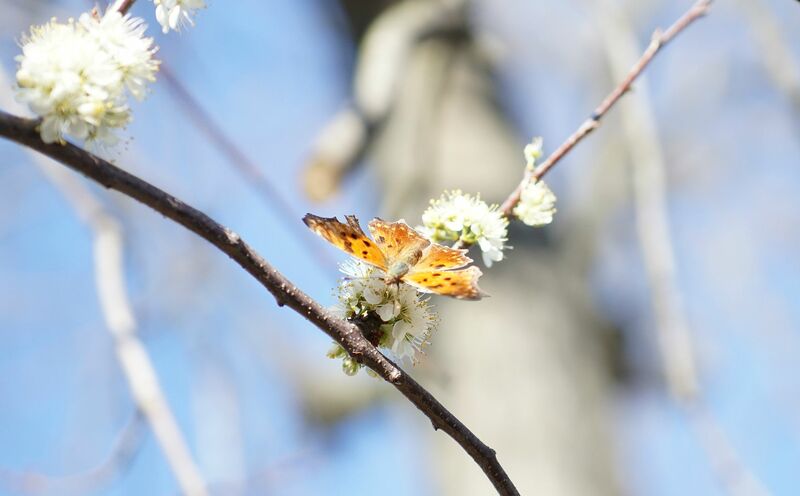 I found an Eastern Comma on my Native Plum today. 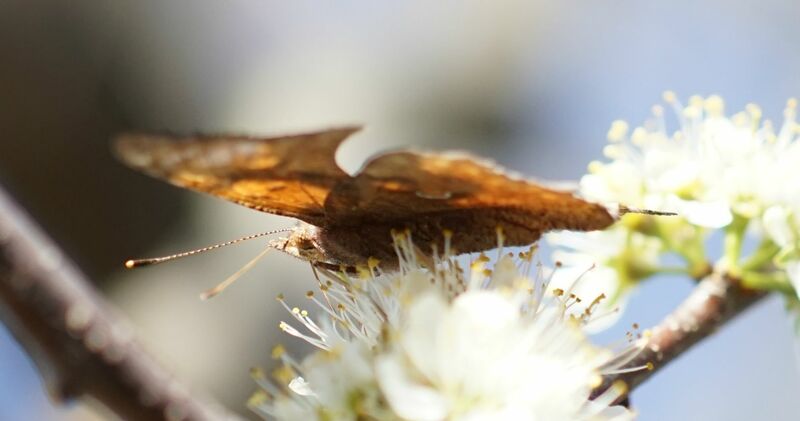 Polygonia comma is a species literally named for it's two C or , shaped marks on the underside of it's rear wings. 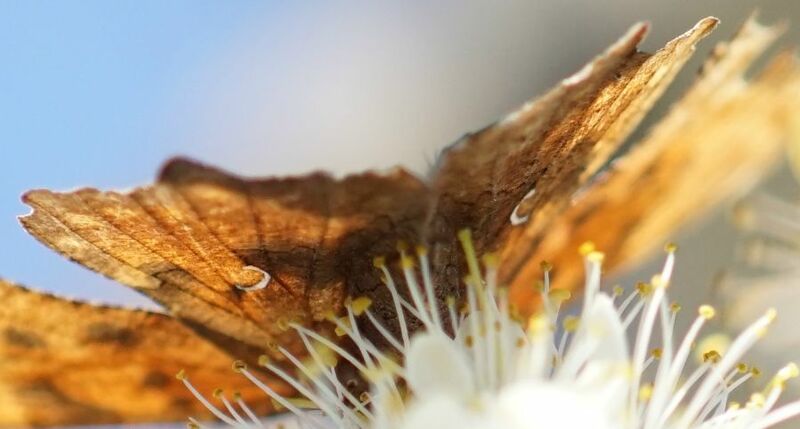 A similar-looking species, Polygonia interrogationis is known as the Question mark because of a break in the C shape, making them look more like question marks. A few years ago I threw a packet of Bloodroot seeds out in the front garden. I dug a little trench and planted them, and two years later I started to see very tiny leaves poking out of the ground. One leaf per plant. They remained this small size for two more years and then suddenly one or two made the jump to a great big leaf more typical of the species. This year three of those plants have decided to flower which is great, but also I'll say so far none of the others have emerged... of the whole seed packet maybe only three have survived. What's odd though is that last year one may have flowers because I found one with a seed head. But this one plant has yet to emerge, whereas the three I see flowering today I didn't even notice last year and I find this to be odd. Perhaps rodents or something are making off with the young shoots before the plants have a chance to grow? 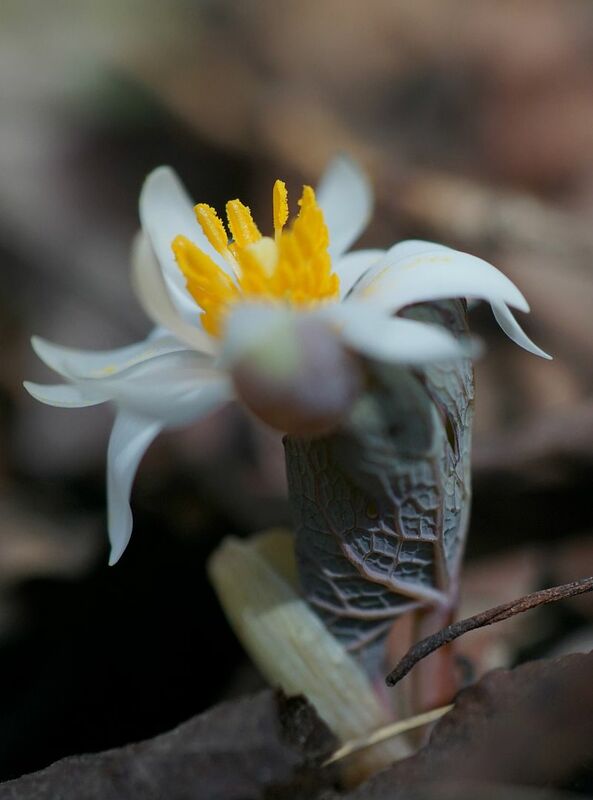 Bloodroot, Sanguinaria canadensis, is in the poppy family. The flowers only produce pollen and don't have any nectar or floral oils of note. 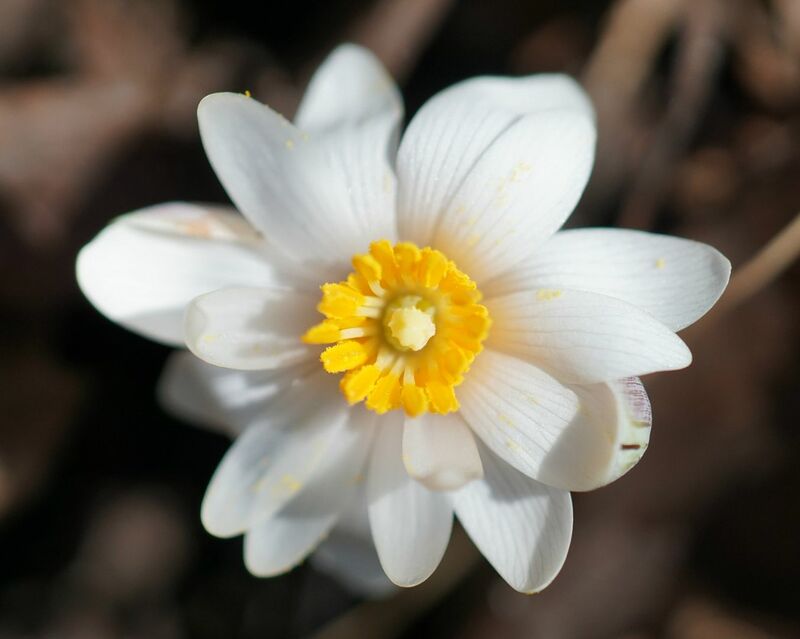 So you'll never see Bloodroot Honey being sold unless someone is grinding up the root and physically mixing it in with the honey, which begs the question, why? The flowers to the true species the true species are short lived, lasting about three "good" days. If the flower stays closed due to rain or it being too cloudy, it doesn't seem to count towards the three days. I believe there are cultivars which bloom slightly longer which tend to be "double flowering" but this term is a little tenuous. All three of my Bloodroot plants are technically "double flowering" because they have more than 8 petals, which is what you find in established plants in the wild. No plant wants to be "double flowering" because it means they're producing more petals instead of reproductive structures, and thus won't make as many seeds. Plants do this when they're not getting the right nutrients or enough of them in the soil. It's the plant's way of cutting its losses, but can get to the point where they don't have any reproductive structures at all. This isn't restricted to Bloodroot. A flame Azalea I bought at Lowes actually came that way, very likely because in the 7 years it takes a nursery to grow a shrub to a sell-able size it wasn't fertilized enough. The following year it flowered normally though so it may have been stressed. So clearly "double flowering" is a nutrient issue... yet there are cultivars that are reliably "double flowering." This is because the plant likely has a mutation which hinders it's own ability to take in certain nutrients. This also means this cultivar can't be propagated by seed. That's not to say that they don't produce seeds, rather and the inability to take in certain nutrients is likely from a recessive gene, so the plant has to be reproduced by cuttings or division of the roots. Coming back to my Bloodroot plants, hopefully their rhizomes get a chance to spread out and grow into a nice sized clump. Ants actually disperse the seeds to these plants, so hopefully I'll get to play around with that later this year. This is the main reason I'm growing this and several other native ephemerals. 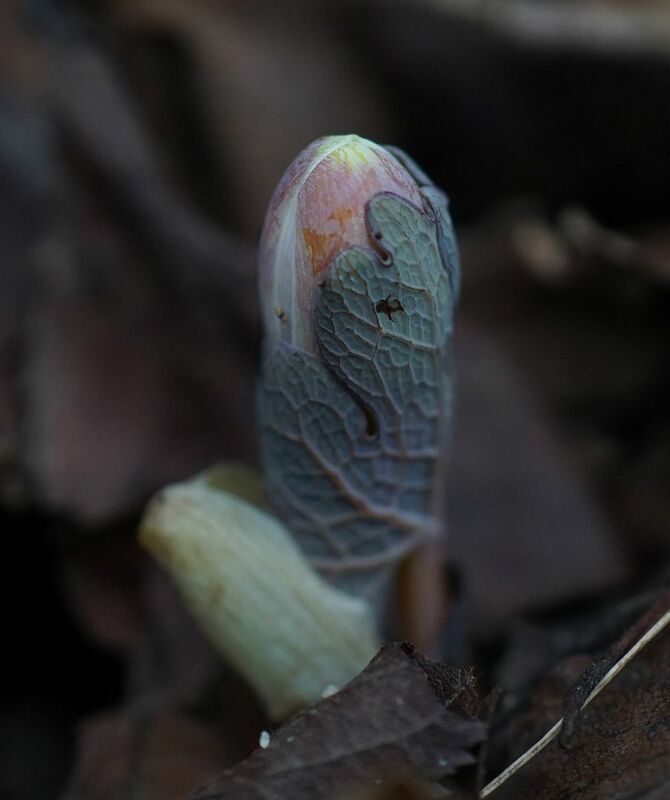 In the past, I've bought Bloodroot plants as bare roots. These grew the first year and flowered, but sadly something came along and ate all of them. Which is annoying. I've noticed with several species though that plants started from seed tend to fair better and aren't devoured by wildlife as much.